When you want to combine your love for technology with your desire to help people, consider a career in medical technology. At Florida National University (FNU), we offer a range of programs from certificates to master’s degrees in areas like Diagnostic Medical Sonographer Technology, Clinical Echocardiography, and Dental Laboratory Technician. There are many opportunities in medical technology, and your advancement potential is directly related to your skill and training. Take a look at the possible career paths for medical sonographer (ultrasound) technicians. NOTE: The following salary information does not guarantee that a professional will earn this reported dollar amount. These salary earnings are reported from the Bureau of Labor Statistics as an estimation. The actual salary of an Ultrasound Technician will vary depending on the institution, location, and the qualifications of each applicant. This is one job where you can earn a lucrative salary with an Associate of Science degree. Monster.com rated ultrasound technology as the second highest paying medical field that you can enter without a four-year degree. According to the most recently available data from the Bureau of Labor Statistics (BLS), ultrasound techs can expect to earn $48,660 per year at entry-level, and the job outlook is expected to grow by 17% over the next eight years. What Factors Into Salary and Career Advancement? Several factors come into play when figuring salary and advancement potential. One is the geological location. The national median income is $69,650, and the average can reach as high as $93,350 if you start your career in California. Even in Alabama, which has the lowest average pay for ultrasound technicians in the country, you can average more than $54,000 per year. There are four factors that can affect your earning potential, so let’s break it down a little more. Location doesn’t just relate to what state or region of the country you’re in, but your demographic area as well. For example, even within California, which has the highest overall average, the salary can vary from one part of the state to another. In the San Francisco area, the average salary is $121,00 per year, while salaries in Santa Clara have a median income of $109,000. Traveling east, you’ll find salaries ranging from $43,890 in Burlington, NC, to $65,990 in Pensacola, FL. The second-highest median income in the country can be found in Washington, DC, which pays $87,570 per year. This is closely followed by Washington State with median incomes of $86,970. In general, the closer you are to an urban or metropolitan area, the higher the pay rate. Above all, those who received more advanced degrees earned more than those who only obtained an additional certification. The top 10% of earners used a combination of two or more methods to further their career. The final factor that can affect your pay rate and career advancement is where you practice. The Bureau of Labor Statistics reports that the bulk of ultrasound technicians, nearly 40,000, work in a hospital setting. The average pay among hospital techs was $73,400. Coming in second for employment numbers but first in pay were the technicians who worked in outpatient settings with an average income of $82,940. Technicians who work in private medical practices or clinics earn about $69,450. Hourly pay for those who don’t have full-time, salaried positions ranges from $33.39 to $39.87. 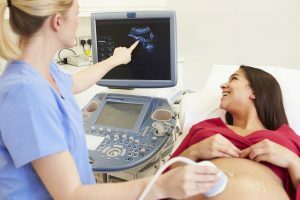 Florida National University offers a comprehensive two-year Associates of Science degree program in Diagnostic Medical Sonographer Technology (DMST). 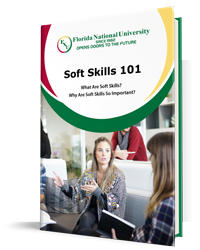 Although some parts of this program can be completed online, the majority of the courses are taken at one of our two campuses in South Florida, located in Hialeah and Miami. Because we’re regionally accredited by the Southern Association of Colleges and Schools Commission on Colleges to award associate, undergraduate, and graduate degrees, you’ll have access to state and federal financial aid programs as well as grants and scholarships. The total program consists of a minimum of 87 credit hours and is designed to be completed within 26 months if you enroll full time. Program requirements also include 800 hours of clinical practice and completion of BLS, OSHA, HIV, and HIPPA seminars. By the time you’re finished with the program, you’ll be prepared to sit for the national certification exam. If this sounds like the kind of career opportunity you’ve been looking for, contact FNU to learn more about our admissions requirements today. We’ve been helping students like you open the doors to the future since 1982.